Thanks to her impeccably decorated workspace, her obsession-worthy blog, and her insanely inspirational Pinterest account, Kelly Wearstler has become the subject of a serious girl crush. 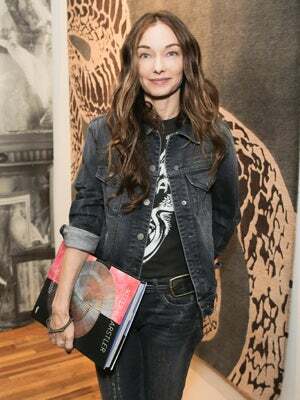 No surprise, then, that we had an absolute blast at her recent Big Apple book party celebrating her fourth publication, Kelly Wearstler: Rhapsody. Showcasing Wearstler's most recent interior design projects as well as her creative process, the internationally renowned designer's new tome is a crash couse that covers all her her swoon-worthy inspirations. We managed to pull Wearstler aside to get a deeper look into her fabulous life. What was it like art directing, laying out, and compiling the entire book in your L.A. studio? What did you love the most and least about the process? "I had a blast laying out the book and giving the book it's voice, while figuring out what I wanted to say. I spoke about the elements I use in my designs — raw and refined tension, my love of metal and scale play. I worked closely with my graphics design department, and the design of the book closely mirrors the interiors. Rizzoli was the publisher and a dream to work with. I look forward to many more!" How would you say Rhapsody is similar to and/or different from your previous three books? "I discuss what my loves are and how I create drama in all my projects. For example, I talk about my love of mixing metals and how to make sure everything looks chic. I also discuss how I play with scale, geometry, and space. I wanted to give the reader inspiration and allow them to learn a bit about my process." It's no secret you are able to find inspiration from a wide variety of sources. What would you say is the most unexpected source of inspiration that you have encountered? "Inspiration can come from anywhere. When I am designing a client’s home they serve as the inspiration. I take their ideas and favorite items as a starting point and build upon them. I also draw inspiration from architecture, fashion, art, street art, jewelry, and books." What are some of your favorite publications when it comes to interior design? "For fashion blogs, I visit Haw-lin.com, Intelligent Clashing, and ffffound.com. For magazines, I love French AD, French Vogue, Purple, and Casa da Abitare. I also have an expansive library collection at home which I love to use for reference." We're so thrilled you were able to host your Rhapsody launch in Manhattan — what are some of your must-visit spots in NYC? "I always make time to shop for vintage and visit the museums." New York apartments don't always offer the most room to work with. Do you have any favorite design tips for maximizing miniature spaces? "Color is a great way to enhance a space. A high gloss paint will be reflective and can make the space feel larger. A mirror is also a great space enhancer." If you had to describe your fashion style in three words, which would you use? "There are so many exciting new projects that I am working on. I am designing an amazing new hotel in San Francisco. I’m also working on new wallpaper, furniture, fine jewelry, and carpets."